YAVORIV, Ukraine -- Today, 40 young leaders from the 45th Infantry Brigade Combat Team graduated the Army's Basic Leader Course. Sgt. Wilson Jackson, a resident of Houston, Texas and a member of the 45th Infantry Brigade Combat Team attending the 7th Army Traning Command Noncommissioned Officer Academy Basic Leader Course while deployed to Ukraine, applies camouflage during a situational training exercise at the Yavoriv Combat Training Center on the International Peacekeeping and Security Center, near Yavoriv, Ukraine, on April 20. A significant achievement, but not necessarily unique - until you consider the circumstances - the Thunderbirds are deployed to a spartan environment in Western Ukraine. Mobilized in support of Joint Multinational Training Group-Ukraine, the Thunderbirds’ mission is to train the Ukrainian army to NATO standards, develop their noncommissioned officer corps, and help them to establish a combat training center, so that in the future, they can continue to train themselves. "It’s about overall professionalism...I think it's important that [the Ukrainians] see us [educating NCOs], because that's how we lead by example," said Cpl. Riley Swan, the distinguished honor graduate. 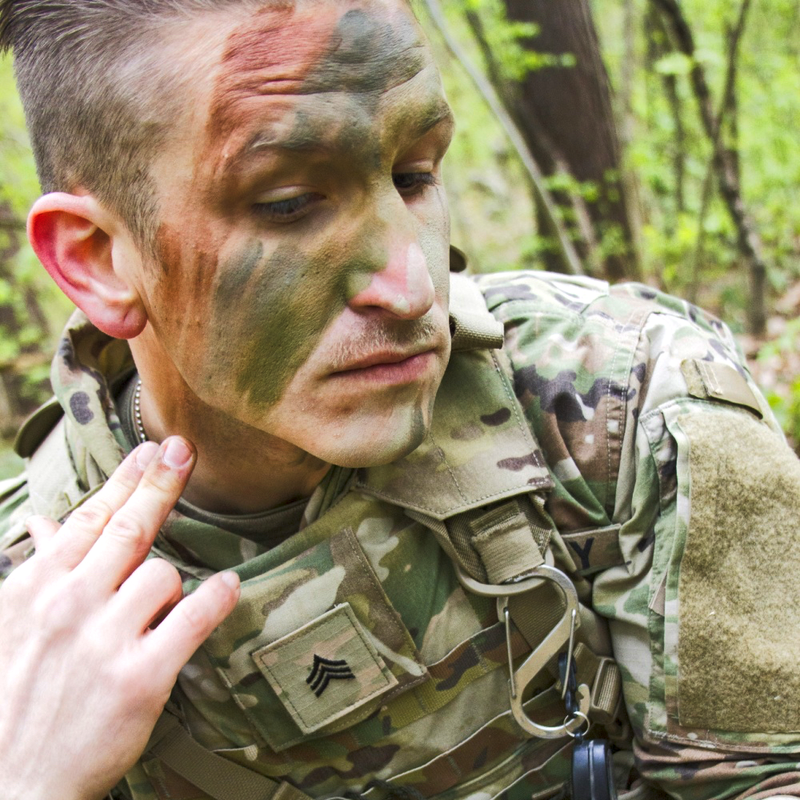 BLC is the first step in the U.S. Army's noncommissioned officer professional education system. Currently, the JMTG-U mission is based around a 55-day training cycle. A short administrative reset period between rotations allowed just enough time for the BLC students to complete their own developmental training. Instructors from 7th Army Training Command were flown in from Grafenwoehr, Germany to facilitate the course. The BLC curriculum is normally 22 days, but due to mission constraints, the program was condensed. The compressed timeline made the course all the more challenging. Students completed all requirements for graduation in just 18 days. The students conducted physical and mental training including land navigation, tactical situational exercise lanes, and health and fitness training. They also learned about resiliency, suicide prevention, equal opportunity, SHARP, and ethical problem solving. We are giving them tools now that will help them solve problems throughout the rest of their careers, explained Staff Sgt. Ivan Rodriguez, an instructor from the 7th ATC, noncommissioned officer academy. “Being mentally and physically tough is an important part of being a soldier,” said Rodriquez.